As the years pass by it is becoming harder and harder to imagine what life would have been like over 100 years ago when the ANZAC’s first landed in Gallipoli. There was no such thing as hashtags or selfies. No social media to share with the world what you ate for breakfast or what was going to fill your day. No internet or smartphones to keep in touch with family and friends. They didn’t even have television until the mid 1920’s. 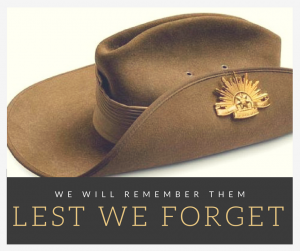 Year after year we continue to watch as the world changes at a rapid pace, but no matter how much time passes, or how different the world may become, one tradition that has and will hopefully always remain the same is ANZAC Day – A day of remembrance. A day where we stop as a nation to remember and commemorate those who have served and sacrificed for our country. In 2015 The New Zealand Dance Company toured Australia to commemorate the Anzac Day Centenary, paying homage through dance with an emotive contemporary performance entitled “Rotunda”. Their performance was a collaboration of contemporary movement depicting different experiences of war – courage, loss, hope, love, sacrifice. Their performance explored the effects of war on future generations and the powerful legacy it left behind. See some of their beautifully symbolic performance in this short piece which they performed live on ‘What Now’ in New Zealand.